Despite some controversy off the field, Ray Lewis is still considered one of the all-time greats in NFL history. The defensive legend dominated opposing offenses for many years, helping the Baltimore Ravens win two Super Bowl titles. 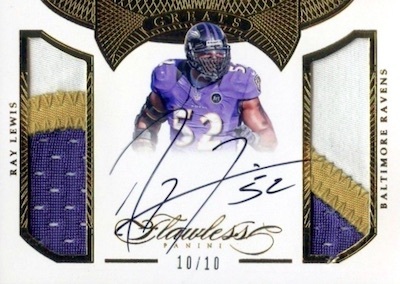 This success also put Ray Lewis cards on the (hobby) map. 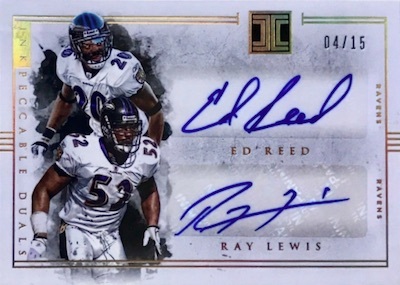 The list below highlights some of the very best Ray Lewis football cards to collect, including his earliest release in 1994, the best 1996 Ray Lewis rookies cards, and a few of his most popular autographs. 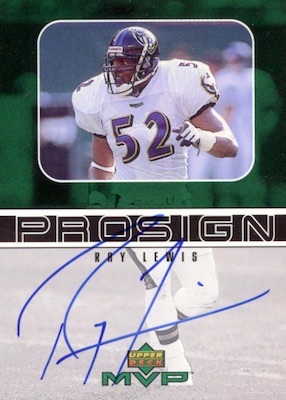 Shop for Ray Lewis autographs on eBay. 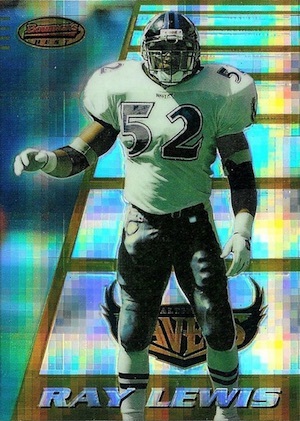 For more cardboard options, check out the full list of Ray Lewis rookie cards. Buy specific cards on eBay using the links below. Bolded sets go directly to detailed profiles when available. 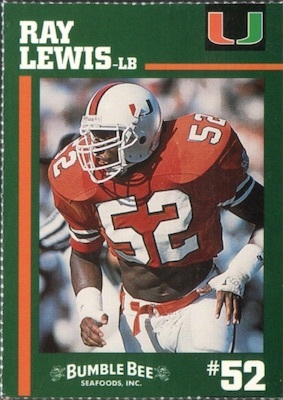 A true college release for Lewis, the 1994 Bumble Bee Seafoods, Inc. set for the Miami Hurricanes came as a perforated sheet. While the card has a dated look, supply is fairly low and gem mint copies can sell into the mid-hundreds. These are also commonly used for autographs. For those interested in digging a little deeper, the same set also includes cards for Warren Sapp and Dwayne Johnson (a.k.a. The Rock). Another familiar name is linebacker Rohan Marley, the son of legendary singer Bob Marley. 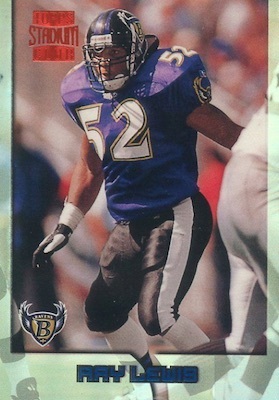 Although there are several Ray Lewis rookie cards, most are unlikely to impress and none are especially valuable. However, the clear standout comes in 1996 Bowman's Best. The base version carries solid interest on its own, but the real value comes with the Refractor and Atomic Refractor editions. If you had to pick a second Ray Lewis rookie card to add to the collection, most would turn to 1996 Stadium Club. The short print also comes in a Member's Only parallel that is identified by the designation on the back. 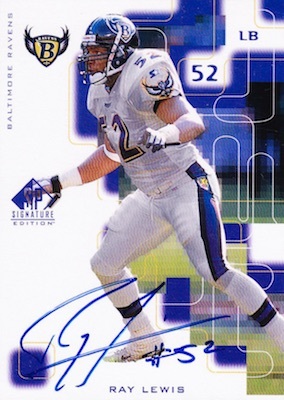 A few years after his rookie cards came the first Ray Lewis autographs. The ProSign insert offers an odd frame design that cuts Lewis in half, but at least provides decent space for the on-card signature. There is also the SP Signature Edition autograph for Lewis that really has the '90s Upper Deck feel. The premium format delivered one autograph in every pack and 12 per box. Lewis has a gold parallel autograph, as well. Outside of those first two options, Ray Lewis autographs come in many forms and the selection has taken off in recent years. Appealing to many collectors are the cards that pair Lewis with another player. In particular, his various combo autographs with former defensive teammate Ed Reed have proven very popular. And you can't go wrong with any of the high-end Ray Lewis autographs that offer on-card autographs, nice patches and low print runs. Many of these are from recent sets as the hobby has pushed more into the premium market.